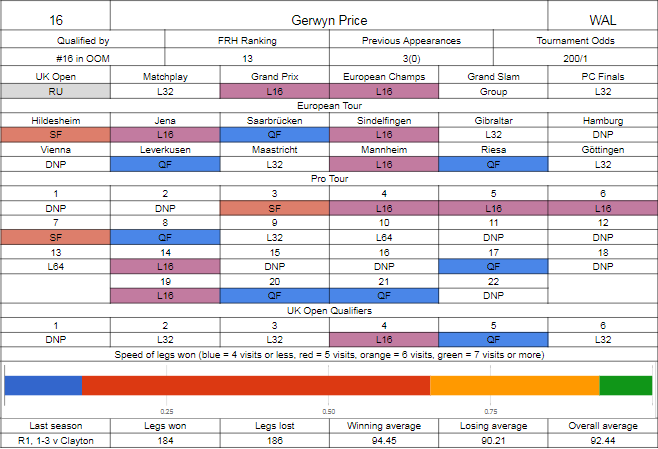 Price made the step up from solid top 32 player who can occasionally win Pro Tour events to legitimate contender this season, mainly because of that UK Open final appearance. Peter Wright would be too strong in the final, and he really should have been eliminated in the semi by Norris who missed darts to break and throw for the match, and should have gone out to potential second round opponent White in the quarters who bust a single darter allowing Price to pin 160. How Hogan didn't beat him after taking out Anderson and Lewis is also a question, but oh well. He's not done a great deal on TV outside of that - he got Taylor in the Matchplay, managed just one win in each of the Grand Prix, European Championship and Players Championship Finals. That UK Open run got him into the Grand Slam (having the World Cup final as backup), but in a win and you're in match against Jamie Hughes, he managed to lose 5-1 which knocked his leg difference badly enough to allow Steve Lennon to advance instead. It could be enough that, if he makes the last sixteen here and doesn't get completely crushed by van Gerwen, that he still makes the Premier League, there's spots available and crowds love someone to hate. His figures are at least indicating he should be worth a punt. On the floor it's mostly been consistency, not making any finals, but three semi finals and eight quarter finals overall is not a bad return, he's well in the bracket where he's seeded for European Tour events, and apart from seemingly forgetting to enter some tournaments mid season, he's had a good record of not dropping the opening match. 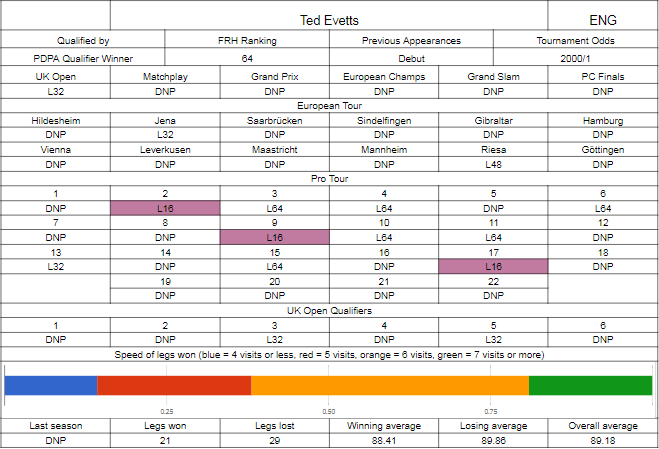 Evetts is a name some people may remember from the 2016 Grand Slam, where he won through the qualifier and although he didn't get any wins, did at least perform respectably against Peter Wright, Jeff Smith and Simon Whitlock. This season he had a good start - in the second year of a tour card needing to get money on the board to retain it, he hit a nine in UK Open qualifying, making the last 32 twice to get into the 96 of the main event. He beat Paul Milford to make the money then Andrew Gilding once there, but got annihilated by Kim Huybrechts in the last 32. His tour form since then has been a bit disappointing, only winning his board three times on the main tour (although he did claim one title on the Development Tour), and only qualifying for Europe twice, falling in the first round to Ronny Huybrechts at Riesa, but getting a victory over Joe Murnan in Jena before pushing Stephen Bunting close. With a record of busting out first round more often than not on the Pro Tour, including in the last five events, it was somewhat of a surprise to see him win the PDPA qualifier, one day after getting to the quarters of the world youth (losing to eventual winner Dimitri van den Bergh 6-4), in a run which saw him overcome an early hurdle in Robbie Green, then a bit of an easier path through to the quarters, i.e. the critical round with three spots available, there he beat Jeffrey de Graaf, defeated Chris Quantock in the semi final to lock his spot here, then a 5-1 job over Brendan Dolan got him through to the first round. By all accounts he was throwing a lot better than he has done at that qualifier, so could be dangerous. After Price went out first round last year, this is the sort of match that's a banana skin, but one he really should be winning. There's a lot at stake, and Evetts isn't going to fear him and should have the crowd on his side. If Price can claim the opening set it might be a bit much for Evetts to chase, but if not, it's definitely game on. And to our final match. 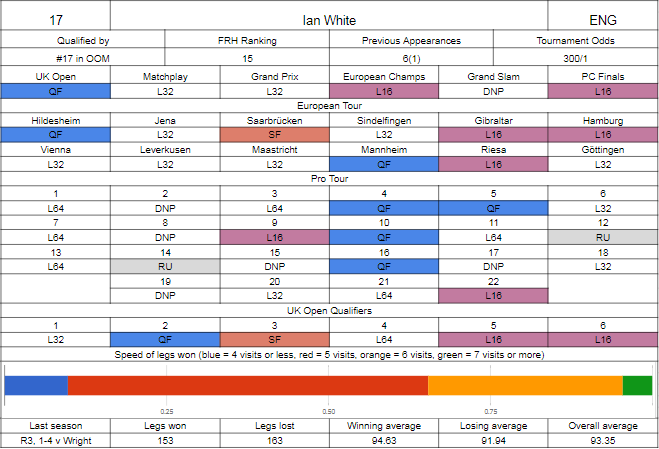 Ian White hasn't been able to add to his list of ranking titles, having managed a hat trick last year, which is a bit of a surprise as he's usually good for at least one each year, and more surprising given that his scoring numbers are really very good, much better than his ranking suggests. We mentioned the UK Open a bit in the Price writeup, that was a big opportunity to get to what would have been a first major semi final, and who knows what from there - Norris certainly wasn't unbeatable. He qualified well, started off in Europe well with a quarter and a semi in the first three events (beaten by van Gerwen in one, beating van Gerwen in another before losing to van de Pas), and would continue in mid season with probably his best chances for a title with two finals in three events - losing a deciding leg to Rob Cross would hurt, losing 6-1 to Gary Anderson maybe as much but in different ways. Since then and since the quick European start he's not done so well, Europe being a lot of first round exits so no points for Diamond, and one and done if it isn't a first round defeat, while two board wins out of the last eight Players Championship events isn't a brilliant return. On TV, he drew Rob Cross in the Matchplay, tough draw but he kept it fairly close at 10-7, at the Grand Prix he took Suljovic to a deciding set but couldn't get it done, he'd beat Darren Webster in Hasselt for a best realistic return (winning just one leg against MvG in the next round), but he couldn't qualify for the Grand Slam having lost to Jeffrey de Zwaan in the qualifier, but at least got a couple of wins in Minehead over Barney and John Henderson before being eliminated by James Wade. For the second year running White will face a preliminary qualifier. Bruguier was somewhat of a surprise winner of the North American qualifier, being relatively unknown at the time and with a few big names to come through, taking out Canadian youngster Dawson Murchell in the semi final before eliminating former qualifier Dave Richardson in a deciding leg in the final. 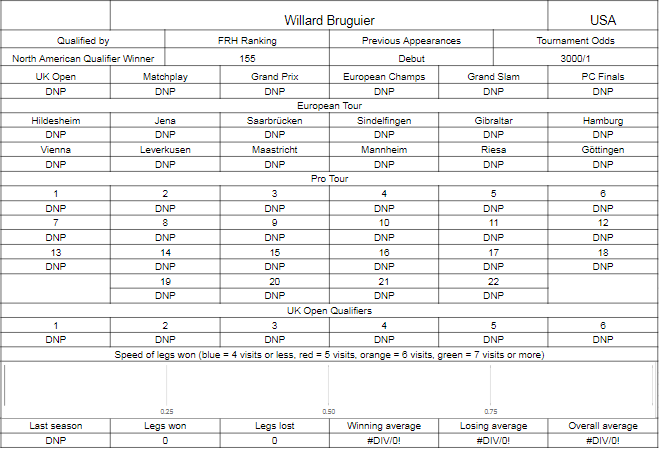 Bruguier would play the US Darts Masters the next day, and lose 6-4 to Gerwyn Price with an 80 average, possibly deflated by only hitting 4/22 on doubles and Price barely reaching 85 himself. He plays some soft tip, and played the 2016 World Masters losing 3-0 to Ratajski, but the amount of information we have is fairly limited. What we do know is that the US qualifier hasn't produced a great standard of player in recent years - Snook did nothing against Viljanen last year, Darin Young didn't look amazing last time out in 2016, and the aforementioned Richardson had his chances against a declining Andy Hamilton but couldn't do anything with them. Cody Harris is on debut here having won the New Zealand qualifier, defeating Rob Szabo and Warren Parry to reach it here, both of whom have made the PDC worlds before. Harris nearly qualified last year, reaching the final of the Oceanic Masters, and this season he's played a fair chunk of the DPA tour, winning three events beating Cadby, Mathers and Mathewson in the finals (those being the top three in the final points standings, Harris ending up seventh). In the World Series exbo events, he did OK - getting four legs off Whitlock in Auckland and three legs off Taylor in Melbourne where he pushed his average into the 90's. He's previously reached the last 32 of the World Masters, apparently averaging near 100 in a 3-0 defeat to Scott Waites, and is a veteran of the World Cup, partnering Szabo and Parry in the last couple of years but being unable to get victories with tough draws against Belgium and Scotland. Harris seems to be the better player based off their general record, but in a short race to two sets anything can happen. I think White should be fairly comfortable if he plays like he can, but it wouldn't take too much of a drop off for things to be in a situation where Harris in particular can capitalise. And that's the lot. Bets to follow in the next couple of days when I've done some further number crunching and looked at the lines in more detail. As I often say, this is a darts blog and not a PDC blog, so I'll briefly comment on the BDO worlds draw - Menzies seems to have a tough one in Conan Whitehead, with a potential game against Finder (formerly Zuiderduin) finalist Jim Williams to follow. Durrant's section looks fine. Mitchell against Labanauskas could be a good one, as could Montgomery against Waites. McGeeney against Adams continues to stack big names up against each other, with the winner to face either James Hurrell, Joe Chaney or a resurgent Danny Noppert who's just remembered to win titles. Harms doesn't have a bad draw, Warren followed by Mandigers or Kenny doesn't seem overly tricky. Hughes should have enough to beat anyone in his path before the quarter finals, which may see him face either Geert de Vos or Richard Veenstra, neither of which will be trivial. Annoyingly there doesn't seem to be much of a report on the BDO site, and that which there is looks truly horrible, but there's some videos on Youtube so I may look back and put stats together for the knockout stages in due course.